Thanks for visiting our industrial style kitchen photo gallery where you can check out all kinds of industrial kitchens (for the home). This is our industrial kitchen design gallery where you can browse all kinds of photos below. We hope you find your inspiration here. We add new designs every week. This industrial kitchen features hardwood flooring and white walls along with white kitchen counter with plank countertop. This industrial kitchen boasts white tiles flooring and stylish black dining table set. This industrial kitchen offers a dining table set for eight. There are bookshelves as well located in the corner. The center island features a modish countertop. Large industrial kitchen with black countertops on both counters and center island. The herringbone flooring looks stunning together with the white walls with decors. An industrial kitchen with very stylish walls and counters. The dining table set with pendant lights looks absolutely stunning as well. This industrial kitchen is surrounded by white walls and hardwood floors. The dining table matches the kitchen’s style. 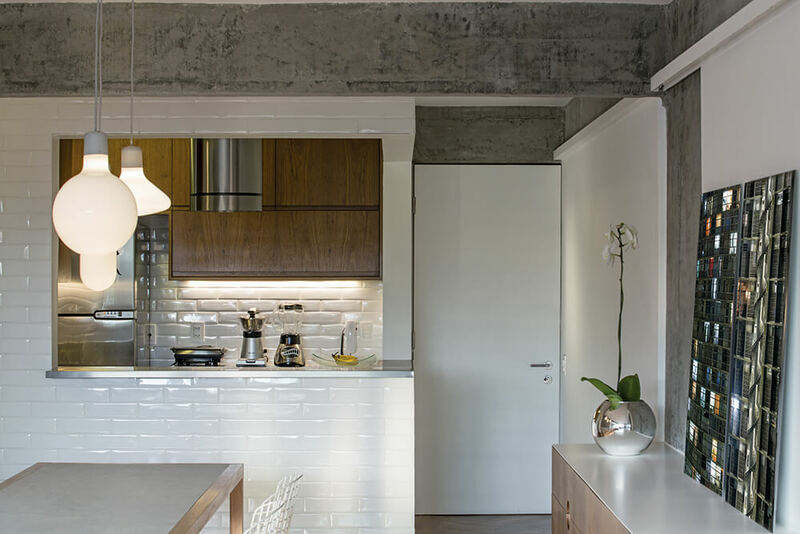 This industrial kitchen basts large concrete tiles flooring and white walls. The counters and the center island both boast black stylish countertops. This industrial kitchen features dark finished flooring along with a brick wall with multiple shelves. The counters and the center island look beautiful. Industrial kitchen with a small center island set on the hardwood flooring. The walls and the decors around the kitchen look very stylish. An industrial kitchen with espresso cabinetry, white kitchen counters and center island and hardwood flooring. An industrial kitchen with a stylish center island with a breakfast bar set on the hardwood flooring and is lighted by a pendant lighting. This industrial kitchen boasts an enchanting ceiling lighting just above the center island with a breakfast bar. Large industrial kitchen with stylish floors and a large center island with a charming countertop. The recessed lights look perfect together with the kitchen’s style. This industrial kitchen features a long center island with marble kitchen set on the hardwood flooring and is lighted by a nice set of pendant lighting. Large industrial kitchen boasting stylish ceiling and glamorous ceiling lights together with a large center island and a dining nook. 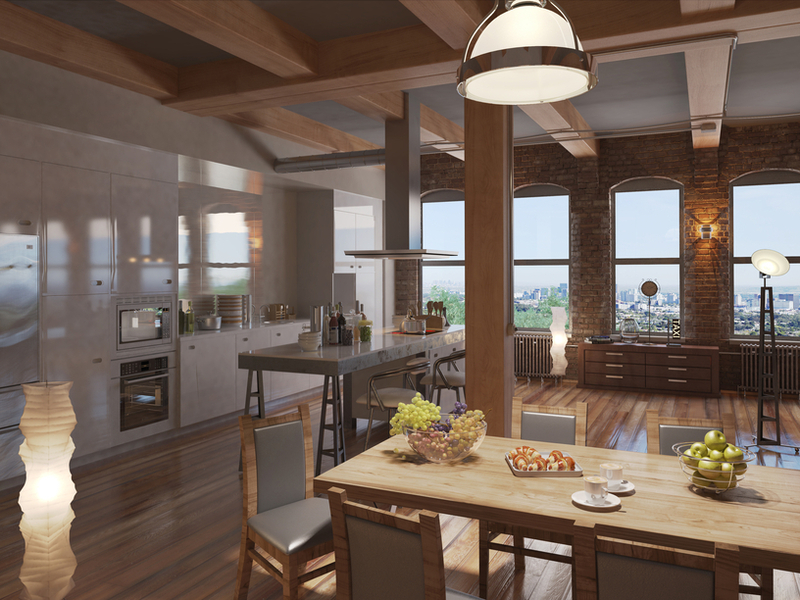 This industrial kitchen boasts hardwood flooring matching the high ceiling with pendant lights. The center island features smooth black countertop. Large industrial kitchen featuring hardwood flooring and a beautiful set of ceiling lights. The center island provides space for a breakfast bar. This industrial kitchen boasts walnut finished cabinetry and kitchen counters, matching well with the tiles flooring. A lovely industrial kitchen with glamorous lighting and beautiful center island with marble countertop. Large industrial kitchen with a large center island with a breakfast bar featuring classy and stylish seats set on the tiles flooring. Large industrial kitchen with hardwood flooring and white walls. The lighting looks absolutely glamorous. The gray shade on the kitchen’s cabinetry, counter and center island look stylish. The gray walls, kitchen counters and cabinetry make this industrial kitchen look stylish. The smooth white countertops look perfect together with the gray shade surrounding the space. A stylish industrial kitchen featuring hardwood floors and a center island with black countertop. The black kitchen backsplash adds style to the kitchen too. A modish house with an industrial kitchen featuring a large center island and a dining table set lighted by track lights. 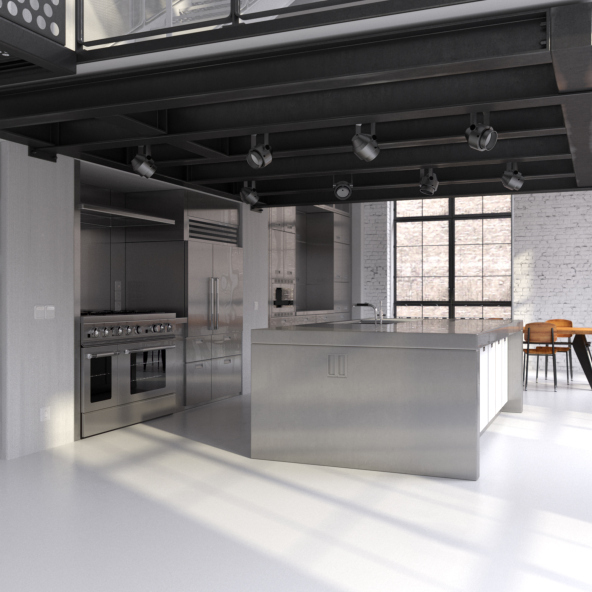 This industrial kitchen has a large center island with marble countertop set on the hardwood flooring. The lighting of this kitchen looks so beautiful. This industrial kitchen offers a breakfast bar and a dining nook, lighted by pendant and recessed lights. 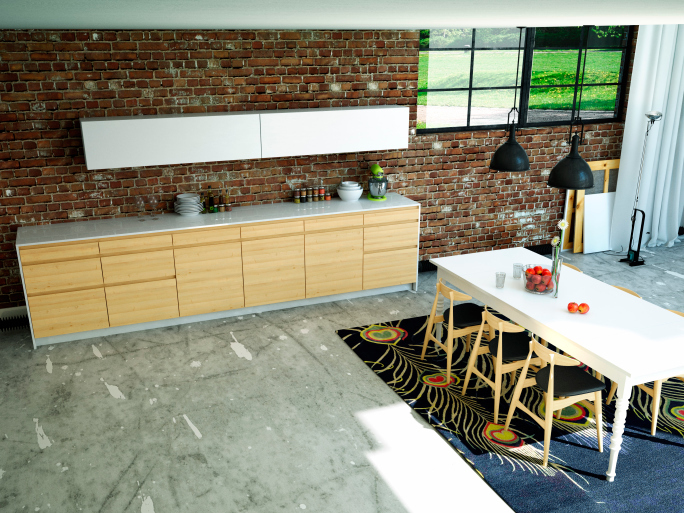 Large industrial kitchen with stylish center island and walls. This kitchen setup is just so stunning and unique. This industrial kitchen boasts green kitchen counters paired with a black countertop. The color combinations make this kitchen looks stylish. Large industrial kitchen with white walls and hardwood flooring. The stylish center island with a marble countertop matches the white walls and ceiling. 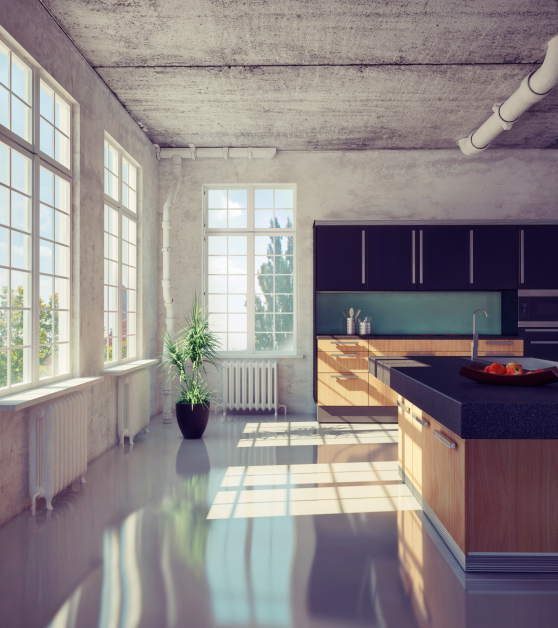 A modish industrial kitchen set with dark flooring and black kitchen counters and cabinets. The center island boasts a white breakfast bar on the side. This industrial kitchen features stylish hardwood flooring and a charming center island with a breakfast bar. The ceiling light looks fantastic. There are cozy couch and a nice seat as well. This industrial kitchen features white walls and countertops. The pendant lights are just so attractive. Large industrial kitchen with a brick wall, hardwood flooring and black countertops on both kitchen counter and center island. The warm white lights make this kitchen look romantic. This industrial kitchen set features hardwood flooring and a small center island for a breakfast bar. The lighting looks absolutely charming. Large industrial kitchen setup with a large center island with a breakfast bar set on the hardwood flooring. The pendant lights look so attractive. Large industrial kitchen with brick walls and stylish countertops on both kitchen counter and center island lighted by a glamorous ceiling light. This large industrial kitchen looks absolutely gorgeous. The breakfast bar is so unique while the shelves and the bar stools look lovely together with the hardwood flooring. Large industrial kitchen with a breakfast bar made of thick planks lighted by stunning ceiling lights. If you decide on an industrial design for your kitchen, there are several elements that you should include in the room. An industrial look calls for open, airy spaces with both natural and electrical lights. If you’re renovating your house and the kitchen is enclosed, consider eliminating a wall to open the space. Industrial designs for home kitchens are not that popular because only about 0.69% in a recent design survey of over 1.78 million kitchens had them. Exposing brick and overhead joists are easy ways to introduce an industrial aesthetic into your kitchen. Since the industrial style is imitating what is found in old factories, the room should have an unfinished look to it. Instead of hiding the ductwork of your home’s HVAC system behind walls, leave it exposed to add to your kitchen’s industrial appearance. Light is also important when giving the kitchen an industrial design. Leave windows bare to allow natural light to flood the space. Install metal industrial light shades to hang over the counters or island as another prominent feature. 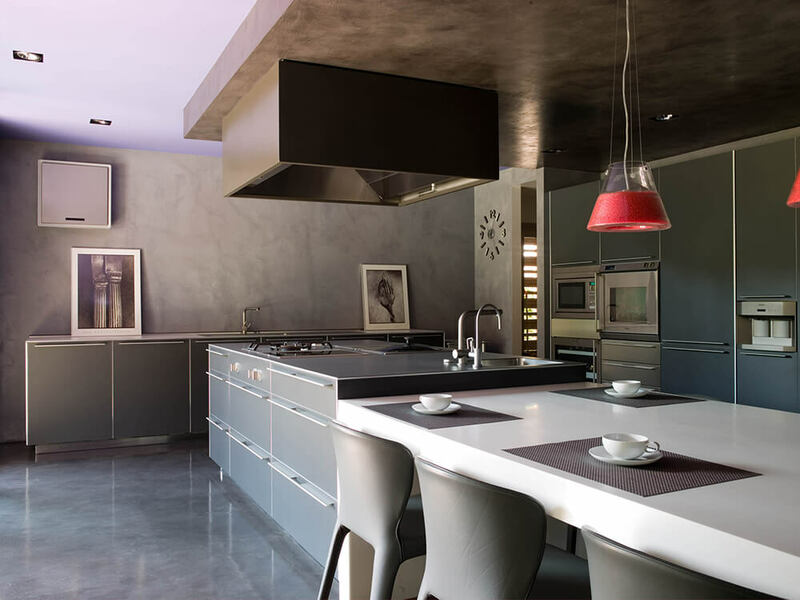 This information about industrial design can tell you which elements are important for creating this kitchen style. 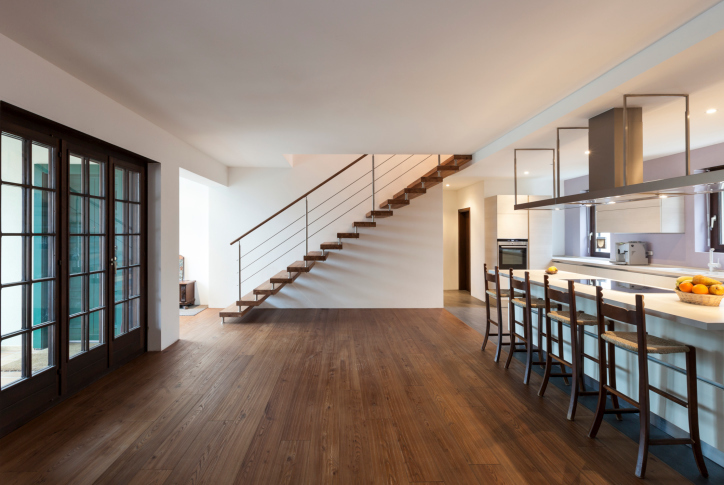 Like most kitchen designs, hardwood flooring works well in an industrial kitchen. Choosing wide planks to imitate reclaimed wood can help to create an unfinished appearance. 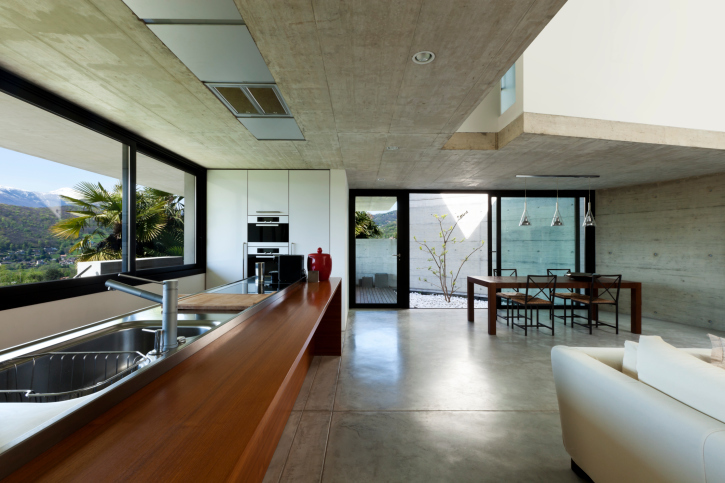 However, concrete also works well in many homes. Concrete is inexpensive, but a creative medium for flooring. It can be stained any color and, during installation, the concrete can be stamped to resemble other flooring types like tiles or wood floors. 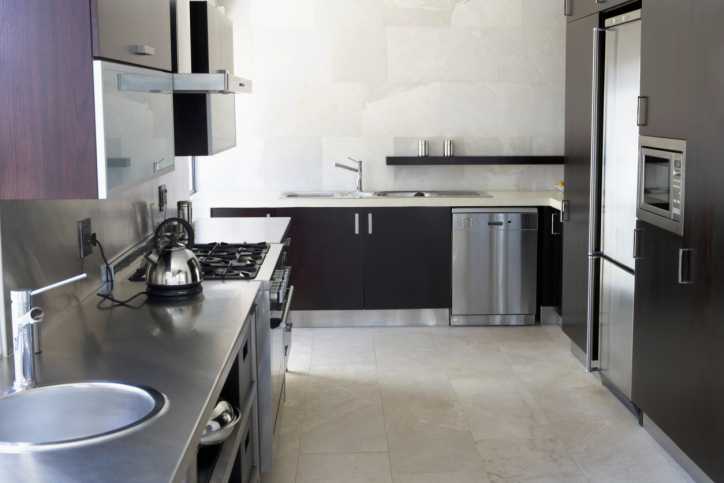 Concrete flooring was found in about two percent of over 575,000 kitchens in the same survey. When choosing furniture and accessories for your industrial kitchen, consider shopping at second-hand and construction salvage shops. Metallic tables, chairs, and metal canisters can add to the industrial vibe. Stainless steel appliances will also fit in well with an industrial design. The factories that spread throughout the United States and other Western countries in the 19th century are nothing like the modern industrial facilities of today. While OSHA regulations and product specifications are the central areas of focus in design today, the first generation of factories were simply awe-inspiring, built of towering brick walls. On the inside, you could see the steel girders and beams that held everything in place. Lights plummeted down from the ceiling to hover over work areas. While the safety record of those factories left a bit to be desired, the aura of those edifices is a popular look for kitchens in modern homes. Check out some of these ideas and photos of industrial kitchen design ideas for your home to take your guests back to the Industrial Revolution when they enter your kitchen. If you’re lucky enough to have brick beneath your sheet rock, you can simply take it off to expose the masonry beneath. If not, you have a couple of options. You can still strip the sheet rock and then apply a brick veneer, or even put a layer of bricks in over the studs. Then, you can either use the natural color of the bricks or paint them to match the color scheme you want for your kitchen. In an authentic factory, you wouldn’t see a finished ceiling. 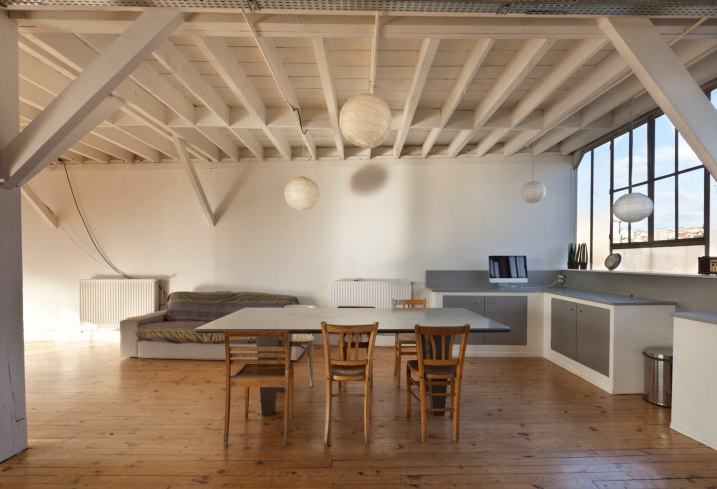 Instead, you would look and see exposed ductwork, pipes and beams. Take out the finished ceiling in your kitchen so that the joists overhead can show through, as well as the ducts. If your ductwork isn’t really worth showing, you can have new ones installed, or you can refinish it. Click here for a project featuring gorgeous ceilings! If you look at pictures of old factories, you see gorgeous light fixtures hanging on long downrods that run up into the ceiling. You can find many of these at secondhand shops or websites like Overstock.com at bargain pricing. Run them up into the ceiling, if you keep it, or up to the point where the wiring connects in. Then run the lights down above your kitchen island. This allows you to replicate the feel of an industrial workspace, and the art deco effects of the lighting can serve as the conversation piece in your kitchen. The typical kitchen island features a countertop of tile, granite or marble, with wooden cabinetry below. To give your kitchen more of an industrial feel, put in a stainless steel top or concrete, and instead of cabinets, have exposed metal shelving. This gives you easier access to your pans and other items you put down there, and it also gives your kitchen the aura of an industrial workshop. Leave the finish on the metal below a little distressed, because real factories wouldn’t have had shiny surfaces on equipment shelves. On the top of the island, you can use a more glossy look to the metal. 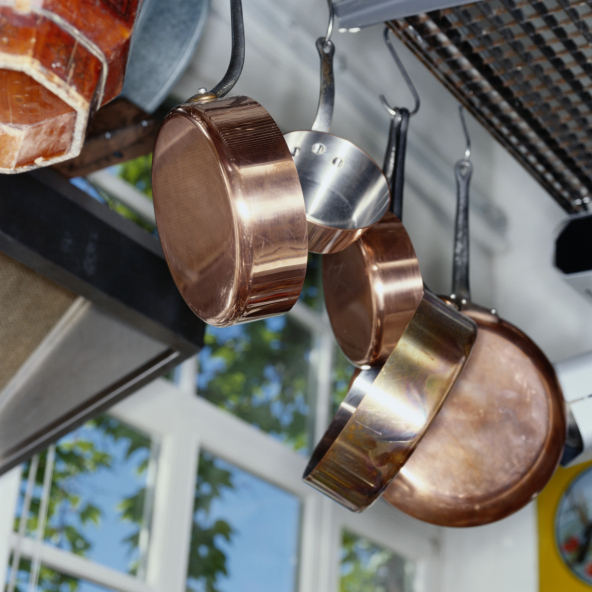 If you have some copper pots and pans, you can install a copper rack that hangs from the joists or the ceilings, and then hang the pots from it. This would work really well with a copper-colored island worktop, and natural wood color in the joists above and the cabinetry above the counter surfaces. The more metal (and particularly the more antiqued metal) you have going in the kitchen, the more effective the industrial look will be for you. If you are willing to spend some time going to flea markets and trolling eBay and some of the furniture-specific secondhand forum sites, you can find some unique pieces to go in your kitchen. There are stools you’ll find that date back over a hundred years that would work well next to your bar. Put a stainless steel flat surface on top of the bar and slide the stools up to it. If you are going for more of a silver and gray look, paint the stools a matte black. If you’re going more for the wood look with the joists and a butcher block look, you can leave more of the brown oxidation on the stools. You can even get creative and build your own factory salvage furniture! Just because you want to create that factory look doesn’t mean that every touch has to come from the Ulysses S. Grant era, of course. On top of the brick, you can hang some modern gridwork to make things a little more eclectic. If you have a stairway coming down into the kitchen or adjacent room, give it a metal railing that matches the look in the kitchen, and attach that gridwork to the bottom of the railing. Take a look at the walls, particularly where you need to support a load. If you have an exterior wall that has points where you don’t need as much support, think about converting it to a glass surface. That way you can convert that wall into windows that bring in natural light. While artificial light coming from some period fixtures is definitely a great idea, natural light spilling in from one wall can also be a breathtaking effect. Many factories from that time period featured walls that were some or all glass, to allow the heat from the industrial processes to escape. 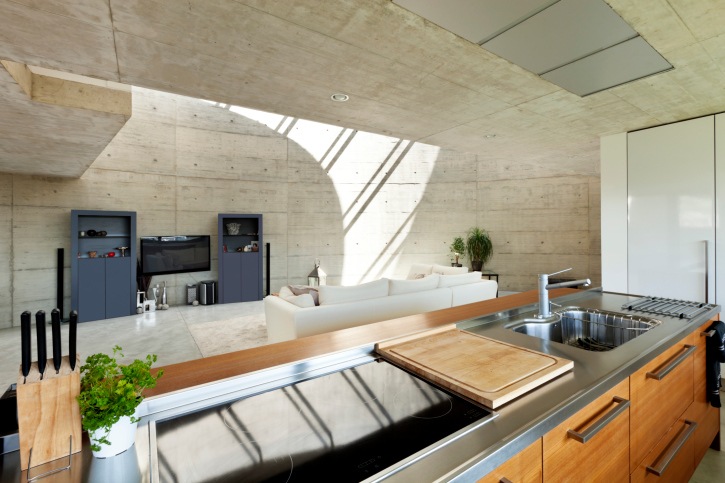 Concrete is becoming more and more popular for home interiors – it’s used for walls, floors, ceilings and countertops. It can be left in the natural state giving it a more industrial look or can have finishes applied that provide more color and design. Concrete, while more expensive than other materials, can be a terrific material for building a home because it’s durable, strong, provides excellent insulation (sound and temperature) and looks very chic (especially if you want to add an industrial look to your design). These are just some of the ideas that decorators have used to create unique industrial spaces inside kitchens. There are as many different possibilities as there are kitchens, and the only limitations that you face come from the available space, the structural requirements of the walls in your kitchen as far as supporting the house, and the money you want to spend. Once you decide on the colors you want your industrial kitchen to highlight, then you have the adventure of picking out the various pieces of your new space. After putting it all together, you will have a space that makes entertaining your friends more exciting. Talk to a decorator in your area if you want an in-home consultation on the best moves for your space.